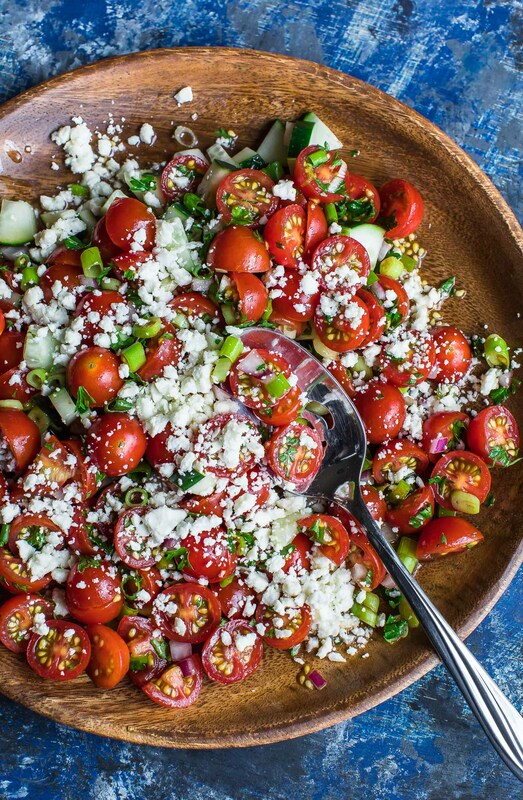 Get ready to serve up this Cherry Tomato Salad all Summer long! This speedy side dish is healthy, fresh, and full of flavor! Dude. My Summer reading list is as dark AF. I’m not making my way through anything too scholarly, mind you, but it’s not the light poolside fluff that typically qualifies as a beach read. My books are more like hurricane season reads. Two chapters into my first book they dropped the serial killer bomb and I’m on the edge of my seat! What are y’all reading right now? I’m looking to add a few more to my list and would love suggestions! I might need to throw in some Colleen Hoover or something YA to lighten things up a bit, but for now I’m pretty darn pleased with myself. So far I’ve gotten through The One and Dark Matter and I’m legit freaking out right now. They are both so supremely well written and played out like a Summer Blockbuster of epic proportions. The plot twists alone have me reeling. I haven’t been able to get either book off my mind and even roped one of my besties into reading along with me because I desperately needed someone to discuss them with. You should join our impromptu book club so we can chat about them too! Of course I can’t send you off to the library without feeding you first, so here’s an easy peasy recipe for the Summer side dish I can’t get enough of! All the storms the Florida panhandle has been having lately have resulted in tomato-palooza in my back yard. The other day the pile of produce on my counter was so comically large I had to wave the white flag. I thought I could get away with adding a sprinkle to my tacos and omelettes as needed, but we’re entering tomato hoarder territory here. We’ve been enjoying this simple cherry tomato salad on repeat lately and for good reason too! It’s light, refreshing, and goes with pretty much everything from falafel stuffed pitas to marinated chicken fresh off the grill! You can even put this salad ON a salad and use it as a topping for a leafy bed of greens or pasta salad. No matter how you serve it, it’s sure to be a hit! 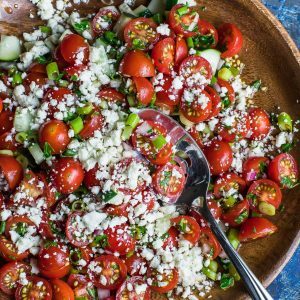 Get ready to serve up this Cherry Tomato Salad all Summer long! This speedy side dish is healthy, fresh, and flavorful! Grab your tomatoes and get chopping! Cut into halves or fourths. 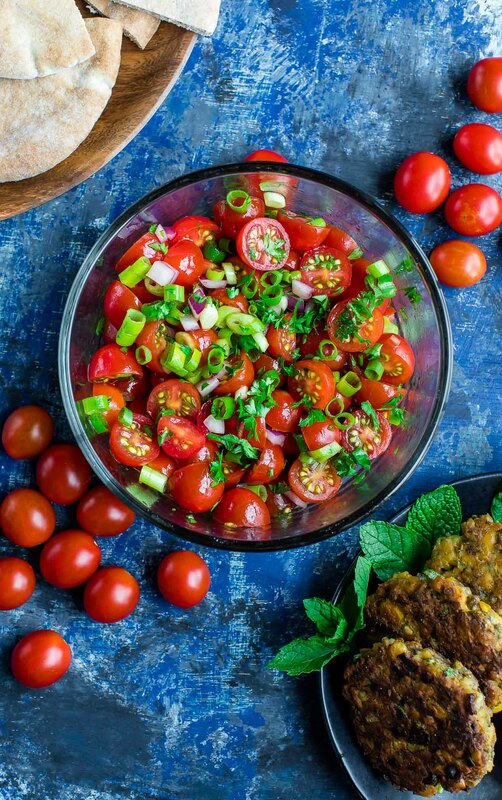 Toss tomatoes with olive oil, vinegar, green onion, and red onion. If you're adding the optional (and DELICIOUS!) cucumber and feta add it here. Mix in some fresh parsley to garnish and dig in! This sassy side salad makes a great topping for grilled chicken and tastes fabulous stuffed into a pita with falafel and tzatziki! It also makes a glorious addition to your next party, potluck, or picnic and tastes great alongside pretty much everything! I even love it served on a fluffy baked sweet potato or atop a fresh pasta salad. Have fun with it! Nutrition facts below are an estimate provided by an online nutrition calculator and calculated before any optional extras were added. There is literally nothing better than a cherry tomato salad this time of year when the tomatoes are so sweet! I LOVE this! Used garden fresh tomatoes to make this tonight and it was incredible! Definitely making it again! What a beautiful salad. I’ve been trying to eat healthier lately, and your blog has been helping me tons. Thank you so much! This cherry tomato salad is the next one I’ll try, I bet it’s super delicious! Love how vibrant this salad is – perfect for summer! This is such a flavorful and easy salad. Refreshing. Perfect for summer. Sooo super refreshing! Thank you Roxana! Summer tomatoes are the best! I just finished “Big Little Lies” (haven’t watched the HBO series yet) and LOVED it. Could not put it down! 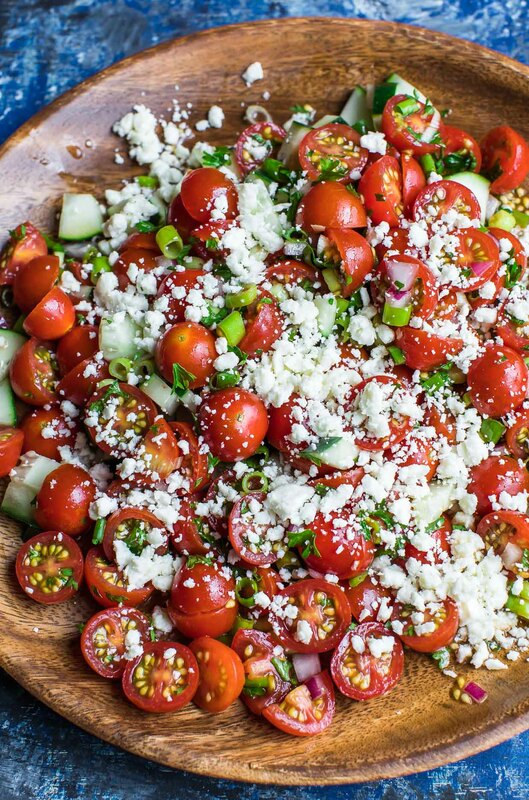 I love cherry tomatoes are the stars in this salad! Looks delicious!